Each day our home becomes more connected. The count of smart devices hungry for Internet connection is increasing. Devices like cameras, movement sensors, weather stations, smart hubs and many more are counting on your home router. That’s why having a networking device with good, reliable, and speedy connection is a must. We don’t use the word – best – lightly, when talk about electronic devices, but today we review one such gadget – the TP-Link Archer C3200. For reference with other device pleas check our comparison table. 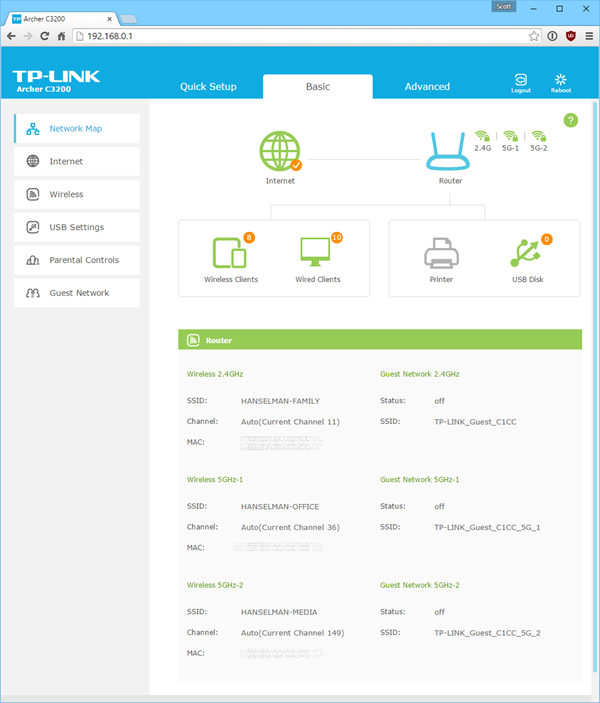 This TP-Link has the support of variety of techniques capable of increasing the Wi-Fi power and strenth of the signal. Things like MIMO 3×3, Beamforming, and Smart Connect. Will this features do the job? Ready our review an find out. 802.11a / n / ac on 5 GHz range with two channels. The box is nothing fancy – a standard package for this class of product with the company’s white and green color. Inside the box you will find the AC adapter, patch cord, power cord, and a set of instructions. The router has strong 6 watts power supply that is able to power a Notebook. TP-Link Archer C3200 looks very futuristic like in science fiction movie. There is not a single smooth section on the body, the design elements look like form science fiction movie. This type of design can be a major drawback for some people, but we think once placed the device will look cool on any type of home interior, and will leave no one indifferent. The six antennas are mounted on the top of the body. They cant be removed, and you need to pull them up the get them in operational position. This we think is a very convenient design for home users. The space at the top panel that, not occupied by the antennas, has perforations for better cooling. Without active cooling, the routers can get quite hot, however, these openings and their size will get rid of the problem. There is a fear of dust accessing trough these holes, but this is nothing a vacuum cleaner wont fix. Activity status for the two USB-ports. There are three active buttons on the front panel. The first one is the super convenient Wi-Fi power button, the second one is the WPS activation, and the third button is for the LEDs. Sometimes the light from the router’s LEDs can interfere with your sleep, This problem is easily solvable with Archer C3200 by turning on the “Night mode“. This mode let you choose the lights on/off state based on your personal schedule. The power and reset button are as usual also on the rare side of the router. Comparing the Archer C3200 with other routers performance characteristics, place him next to the best devices suitable for home use. 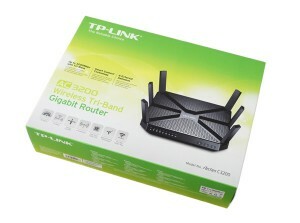 For starters let’s see the ranges the router operates on. One channel is reserved for 2.4 GHz band, Wi-Fi 802.11b/g/n standard mode with a max speed 600 Mbit/s, and two more channels on 5 GHz band, Wi- Fi 802.11a/n/ac standard with speed no more than 1300 Mbit/s. The 5 Ghz channels is convenient feature that will increase the number of device you can connect. They will also decrease the chance of a slower device putting a speed limit on faster ones. In one such case a connected smartphone with Wi-Fi 802.11n support on the first 5 GHz channel, wont interfere with a faster laptop (Wi-Fi 802.11as) on a second. 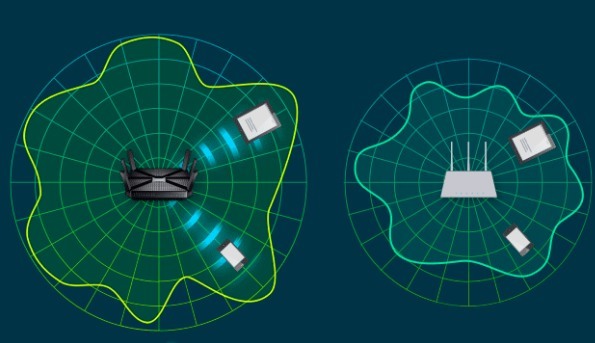 For maximum WiFi data transmission the TP-Link Archer C3200 has two more technologies. The MIMO 3×3 antenna which makes three different antennas to receive and transmit data simultaneously. 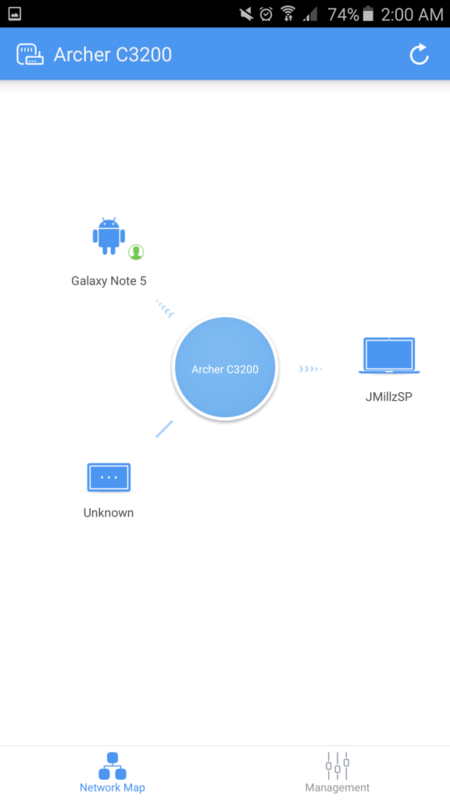 MIMO 2×2 is already becoming popular with some smartphones and notebooks, making the Archer C3200 good choice if you want future support for trouble-free same channel multiple devices connection. Beamforming tech is extremely useful feature for large offices and homes. It finds your exact location than sends a stronger signal at your direction. There are four powerful processor ensuring that large amount of data can pass trough the device. The main processor is a 1 GHz dual Broadcom BCM4709A. Each of the three radio modules are charged by a separate Broadcom BCM43602 processors. The one thing that looks a bit strange by today’s standards is the RAM – 128 MB. However, the RAM will not limit the transmission speed, but for intensive operations, such as QoS, extra memory would not be bad. We have to note that, while testing the device there where no problems what so ever related to the amount of ram and the and the C3200 performance. The USB-ports, version 2.0 and 3.0, will take care of C3200’s ability to mount external peripherals. TP-Link provides a utility for printing so you can use the second port to connect your printer. The first login goes trough your browser, the web-based interface will direct you to a setup guide for connecting and setting up your wireless network. If you don’t have any additional custom settings, and the when the guide is finished, your will be able to wonder wirelessly trough the Internet. For more info and precise adjustments of the router’s functions use the “Basic settings” section. This sections gives data on the devices operation status, local network connections, clients connected, WAN status, USB info and others. Inexperienced users should not be intimidated by the interface. There is a tip system parallel to the interface that proves to be quite helpful. In basic setting mode you will find only the most necessary options – parental control, USB-devices configuration, guest network. Port forwarding, QoS and IPv6 config other advanced settings are found in “Advanced Settings” tab. One if the advanced settings worth mention is the Smart connect function. Turning this function on makes the router control its channels connection by itself, and thus redirecting each connected device on the appropriate channel. If one of the 5 GHz frequency channel is occupied by a device with 802.11ac support, the radio module will be changed to “802.11ac” – the highest transfer rate mode. 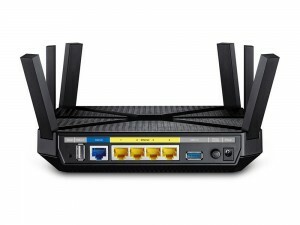 But if the connect device has support for 802.11n only, the router will redirect the data transfer to “802.11n / ac mixed”. One place where the router lacks functionality is with repeater and bridge mode. There is no option to build a wireless array network because this device can only work as master. Another feature that’s missing is the ability to configure it as VPN server. You can forward the ports and configure the DDNS, but this is no substitute for a full feature access to your local network from outside. A possible solution is to tap a dedicated computers, make VPN server on it, and configure the settings inside the DMZ. 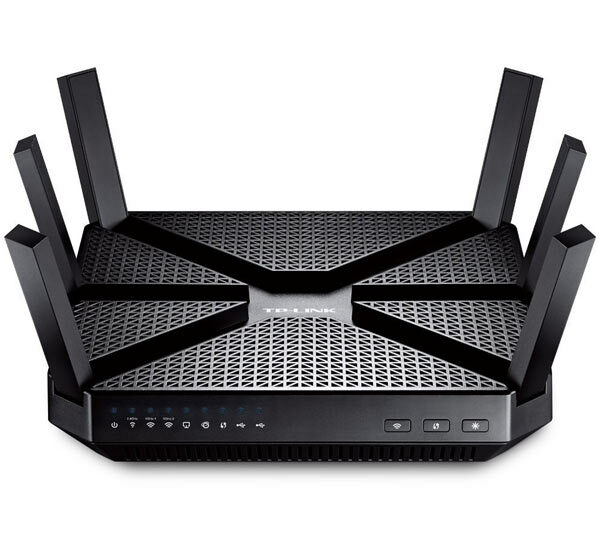 While testing the Archer C3200 speed, we could not never the router’s speed limits. Since not to many people have access to 1300 or even 600 Mbit/s Internet connection, the only way to reach the router max speed was to put load from a multiple connections on the local network. And thanks to MIMO technology the device passed the test flawlessly. While doing the test we connected three devices at 2.4 GHz and six at 5 GHz frequency, and all of this was achieved without reducing the speed of data transmission. Considering this, the Archer C3200 appears to be not only suitable for your home, but also for your work environment, even with increased simultaneous connections. While working on the speed tests we also analyzed the connection strength. For this experiment we put two devices – a laptop and a C3200 on each side of two office walls. The speed we reached was around 200 Mbit/s. 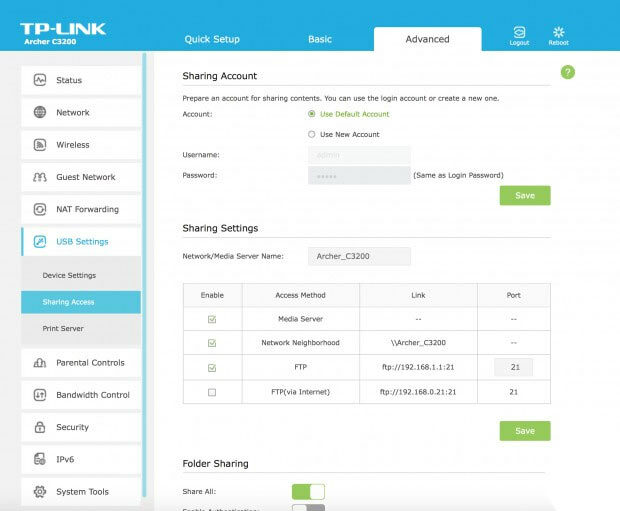 You can skip the web interface when you need a a quick change of most used router settings. For this the manufacturer has developed a free of charge mobile application, available for Android and iOS. On initial start the app will automatically communicate with the router and ask for your login credentials. After successful login you will be redirected to the main screen with two base sections. The first one is a map of the network, with info on all currently connected devices. Each device in the list has a sub section with additional information about the connection, MAC address, IP-addresses, and button for restricting the Internet access. The next tab contains the router’s settings, guest network and parental controls. The app does not provide the full functionality given by the web interface, but it is good for quick changes in settings. Currently the TP-Link Archer C3200 has a price of around $200, not cheap but considering the features the device will serve you well for years. When you make the purchase decision about TP-Link Archer C3200, think about the future and the ever increasing number of gadgets entering your home. All the features of this router are targeted toward this moment. Today the fast 802.11ac Wi-Fi becomes more and more popular with the laptops and smartphones using it. Having a powerful device with three radio frequencies, providing internet at high speed to many gadget in your smart home environment is e good investment. Lack of VPN server functionality.